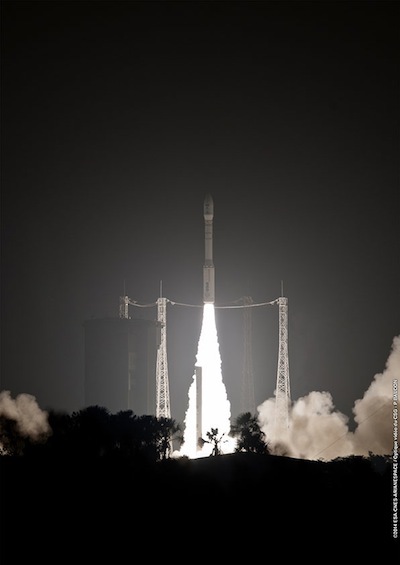 A lightweight Vega launcher raced into space from French Guiana on Tuesday night, boosting a European-built satellite into a 466-mile-high polar orbit with a high-resolution telescope to survey cities, natural resources, and disasters for Kazakh government authorities. Launching on its third mission, the four-stage rocket ignited its solid-fueled first stage at 0135:15 GMT Wednesday (9:35 p.m. EDT; 10:35 p.m. local time Tuesday) and fired into the sky over the European-run Guiana Space Center on the northeast coast of South America. The 98-foot-tall rocket surpassed the speed of sound within 30 seconds as it turned north over the Atlantic Ocean bound for a polar orbit with Kazakhstan's DZZ-HR imaging satellite. The launch was delayed from Monday night to give officials time to evaluate a problem with an umbilical line providing ventilation to the DZZ-HR spacecraft on top of the Vega rocket, according to Arianespace, the commercial operator of the Vega launcher. Loaded with fuel and equipped with a sharp-eyed optical camera, the spacecraft weighed 1,830 pounds at launch and stands about 12.1 feet (3.7 meters) tall. Kazakh officials planned to rename the satellite KazEOSat 1 once it reached its assigned orbit, according to Arianespace. Arianespace declared the mission a success within an hour after liftoff, once the four-stage Vega rocket released KazEOSat 1 into orbit about 750 kilometers, or 466 miles, above Earth. "After a rather long night and day, it is my pleasure to confirm the third successful launch of Vega and to announce the perfect separation of KazEOSat 1 ... in its targeted sun-synchronous orbit," said Stephane Israel, Arianespace's chairman and CEO. The light launcher can place up to 1,500 kilograms, or 3,306 pounds, into a 700-kilometer (435-mile) circular orbit. Such capabilities are optimized for many commercial and government-owned Earth observation satellites, such as the high-resolution mapping platform launched Tuesday night. "Vega has already experienced great commercial success with 50 percent of its commercial launches intended for export customers outside the EU," Israel said. The Vega rocket is booked to launch satellites for Turkey, the United Arab Emirates and Israel, plus payloads for the European Space Agency and its member states. Tuesday's mission was the 87th successful launch in a row for Arianespace since 2002, counting the French company's workhorse Ariane 5 rocket, the retired Ariane 4 launcher, three flights of the Vega, and Arianespace-run launches of the Russian-built Soyuz rocket from French Guiana and the Baikonur Cosmodrome in Kazakhstan. The KazEOSat 1 satellite launched Tuesday is Kazakhstan's first Earth observation spacecraft. "Today, we witnessed an historic event -- the first Kazakh remote sensing satellite [was launched]," said Talgat Musabayev, head of Kazcosmos, Kazakhstan's national space agency. The optical telescope on-board the spacecraft will take images with a maximum resolution of 1 meter, or about 3.3 feet, sharp enough to spot cars. Built by Airbus Defence and Space, the KazEOSat 1 spacecraft was bundled in an agreement with the European aerospace contractor which included training of up to 60 Kazakh satellite controllers and engineers. Kazakhstan also selected Airbus Defence and Space, formerly known as EADS Astrium, to supply equipment for a new satellite integration and test center in Astana. Airbus signed the contract to supply KazEOSat 1, along with a smaller medium-resolution imaging satellite named KazEOSat 2, during a visit of then-French President Nicolas Sarkozy to Kazakhstan in October 2009. The deal was valued at 230 million euros, or about $340 million at 2009 exchange rates. "This is the first practical result in the strategic partnership between Kazakhstan and France in the field of space activities," Musabayev said. The launch on a European Vega rocket was arranged by Airbus, which announced the contract with Arianespace in June 2012. 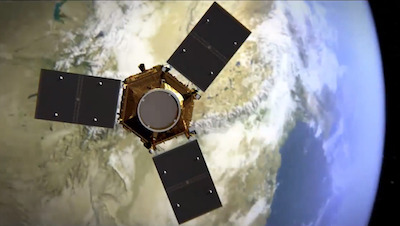 Designed to operate more than seven years, KazEOSat 1 gives Kazakhstan autonomy in mapping and surveillance from space, and the satellite's imagery will help in security, border control, disaster response, resource management and environmental monitoring. "Like the most advanced space systems that we have built, namely Gaia, Herschel and Spot 6, KazEOSat 1 benefits from cutting-edge technologies, new avionics, silicon carbide, a large aperture and an agile platform," said Francois Auque, head of space systems at Airbus. "Furthermore, through our training program, we have transferred our knowledge to the engineers from Kazakhstan who will operate the satellite, enabling Kazakhstan to control the satellite completely autonomously, and collect and use the images provided by the satellite." Officials expect the first image from the new spacecraft to be downloaded within three days of launch, and Airbus will hand over control of the satellite to a ground center in Astana by mid-May. The smaller medium-resolution Kazakh remote sensing satellite was built by Surrey Satellite Technology Ltd., a British subsidiary of Airbus Defence and Space. It is set for launch on a Soyuz rocket in June from the Baikonur Cosmodrome. 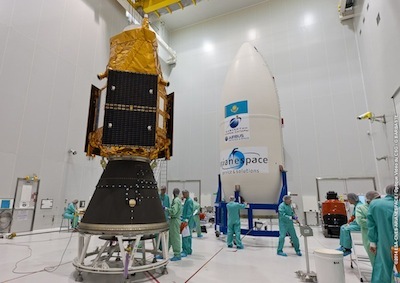 Next on Arianespace's manifest after Tuesday night's launch is the scheduled May 28 liftoff of an Ariane 5 rocket with communications satellites for Malaysian and Australian operators. The next Vega mission is supposed to launch in late 2014 with the European Space Agency's lifting body re-entry prototype -- the Intermediate Experimental Vehicle. Arianespace has 10 satellites queued for launch on Vega rockets over the next few years, and the company ordered 10 more Vega launchers in November 2013 from ELV SpA of Rome, the vehicle's lead contractor, to cover market demands through the end of 2018. Officials hope to launch two Vega rockets this year, including the Tuesday night flight, with three Vega launches scheduled for 2015. Arianespace officials have said reaching a three-launch per year milestone would achieve maximum efficiency for Vega, ensuring a launch price between $46 million and $59 million per flight. The third Vega mission came after the solid-fueled launcher's initial two flights in February 2012 and May 2013.